Expansion of the volume of ethanol exported to the rest of the world is critical to profitability and expansion of the industry. Exports continue to set records (927 million gallons in the first seven months of 2018) but can be limited by challenges created by inconsistency in quality specifications and the methods used to guarantee them. U.S. Water has stepped forward in the last two years to help our customers overcome these challenges. Large foreign consumers are expanding their import volumes and additional nations are engaging with United States ethanol producers. Global restrictions to grain-based ethanol are relaxing and export opportunities have established value to the United States industry as market years 2017 and 2018 both set export records. Plants can continue to operate at full capacity or expand with higher profitability. 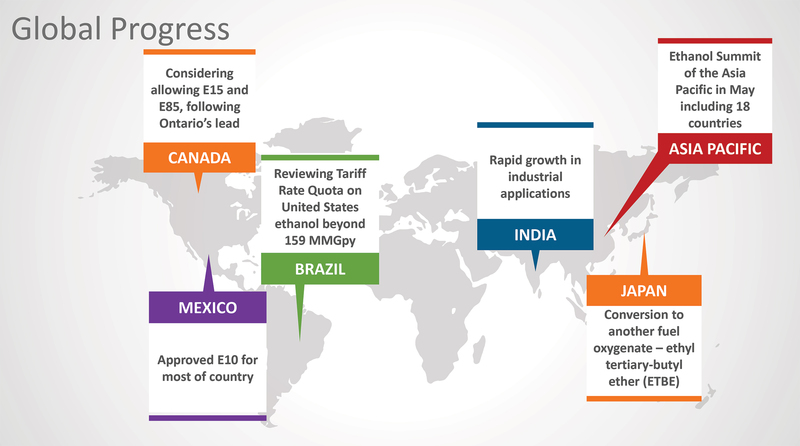 Mexico has approved E10 for most of their country. Canada is considering allowing E15 and E85 nationwide, following Ontario’s lead. Brazil is reviewing quota on United States ethanol beyond 159 MMgpy. Southeast Asian countries are cooperating with the United States to grow their imports including Australia, Bangladesh, China, India, Indonesia, Japan, Korea, Malaysia, Myanmar, New Zealand, Pakistan, Philippines, Singapore, Sri Lanka, Taiwan, Thailand and Vietnam. India is already experiencing rapid growth in industrial applications of United States ethanol. Japan is already converting from sugarcane-based oxygenate to starch-based ethanol for production of ethyl tertiary-butyl ether (ETBE). Previously, Japan’s fuel policy only allowed sugarcane-based ethanol to be imported for the production of ETBE. Japan has also mandated emission reduction by increasing ethanol usage from 50% to 55%. This policy also recognizes United States ethanol as approved for meeting this target and allows up to 44% of Japanese demand which could mean 95 million gallons per year. China offers significant volume opportunities if the tariff situation is favorably resolved. As international specifications and test methods vary from country-to-country and by application, the fuel ethanol industry continues its reliance on innovation to meet the demands of the emerging export market. U. S. Water’s focus on the ethanol industry, experience and proven solutions are well positioned to evolve with the industry as it grows and prospers. We provide cost-effective chemical solutions including the deposit preventer pHytOUT® with a complementary process deposit inhibitor, ProHib, and deposit cleaner, ProClean. Final product corrosion inhibition and pHe elevation are achieved through CorrPro. U.S. Water’s Ethanol Final Filter, a specialized unit operation for submicron filtration and removal of soluble contaminants, complements the chemical solutions. Together with our customized consulting and analytical services, U.S. Water partners with our customers to ensure consistent product specifications as the emerging export market approaches exporting a billion gallons per year.